French resident in Italy, with a Bachelor of Arts in Italian Studies at the University of Birmingham (UK), a Degree in Forms and Performing Techniques at Sapienza University of Rome (ITA) and a Master’s Degree in Documentary Production at the Ecole du documentaire de Lussas / Université Stendhal of Grenoble (FRA). In the last ten years Camille has been involved in film writing and production and in cultural initiatives in several European organizations such as the Alliance Française, the Italian Cultural Institute and in important film productions such as Galatée Films (FRA). 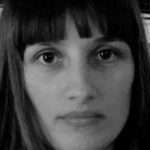 In the world of documentary and in particular with Esplorare la Metropoli Camille deals with production, creative writing and text draftings in Italian, French and English managing the international productions contents.